Illustrating how to publish HTML5 Canvas project with Flash CC. This article assumes that you have a basic knowledge of Adobe Flash CC. If not, please have a look at the links I have provided at the end of this article. It may also help to have some knowledge of the CreateJS libraries, which the exported HTML5 content relies on. Our first goal is to get a better understanding of what is being generated by Flash CC. I have to admit the first time I saw the “ToolKit for CreateJS” export Flash assets into HTML5 canvas from Flash Pro CS6, I was blown away. I couldn’t believe what I just witnessed: a complex vector animation which spanned hundreds of frames, exported in the blink of an eye. It looked exactly like a SWF. It was so cool – but what I was really amazed at was the sheer speed of this export tool. It didn’t take seconds, it took milliseconds! Yikes! What does this mean?!? How does this black magic work? And most importantly, how can I use any of this? Well I can sum most of these questions with… You don’t need to know everything that gets exported to take advantage of the exported code. What you see above is not even necessary to fully understand, but actually quite simple to read once you get the hang of the EaselJS drawing API. This just shows the creation of a Shape that gets a fill color with an empty stroke. The encoded string is series of drawing instructions for a complex path – which is intended to be compact, and not legible. In fact it uses the handy “Tiny API” methods that EaselJS supports to make it even more compact. So you get a pass for not remembering how to do it manually. If you really want to see what is going on, you can actually toggle the un-compacted instructions using the publish settings. The following is a bare-bone example of how to publish an HTML5 Canvas document with Flash CC in 4 simple steps. Create a new HTML5 Canvas with the default settings and save it. In this demo, I am using the name “BallTest.fla”. Create a new MovieClip symbol called “MyBall”, and draw a simple circle. 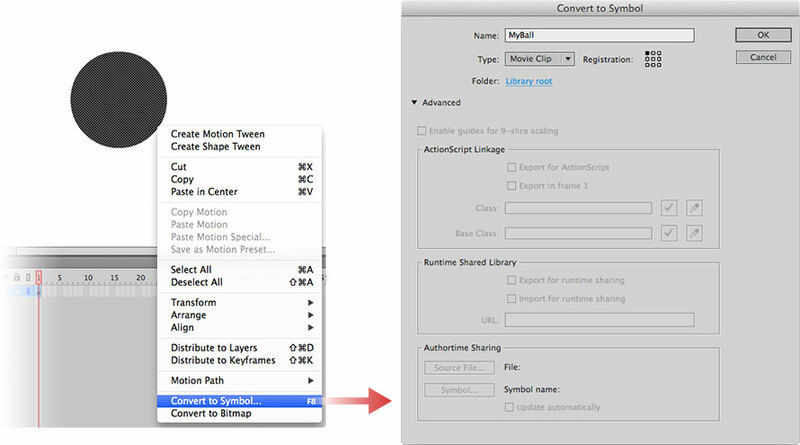 Right click on your selected graphic and select convert to a symbol. Unlike Flash, you don’t need to enter a “linkage”. All symbols in the library are exported. This step is optional, but recommended. Have a look at the “Publish Settings” (under the file menu) to ensure everything will export as intended. Most of this can be left with the default values, but it is good to know what control you have over the exported code. Output File is the path where your files will be generated. Defaults to the location of FLA.
Loop timeline allows for the looping of timelines when checked. Checked by default. Publish HTML generates the HTML page each time files is published. This will overwrite any additions made to HTML file. Checked by default. It is a good idea to turn this off if you modify the HTML page source manually, otherwise it may be overwritten. Asset Export Options specifies the default locations for assets (images, sounds, CreateJS libs). When unchecked, these assets are not exported from the FLA. Hosted libraries determines if the CreateJS libraries on the hosted CDN are used instead of local versions. If unchecked, each library will be added to project directory when publishing. Include Hidden Layers toggles if hidden layers will be included when publishing. Compact Shapes determines vector instruction are published in a compact form (see above), or more readable instructions. Multiframe bounds makes exported symbols have an array of visual bounds for each frame, or only a single bounds for each shape. Note: This will increase publish times. Now we are ready to Publish! 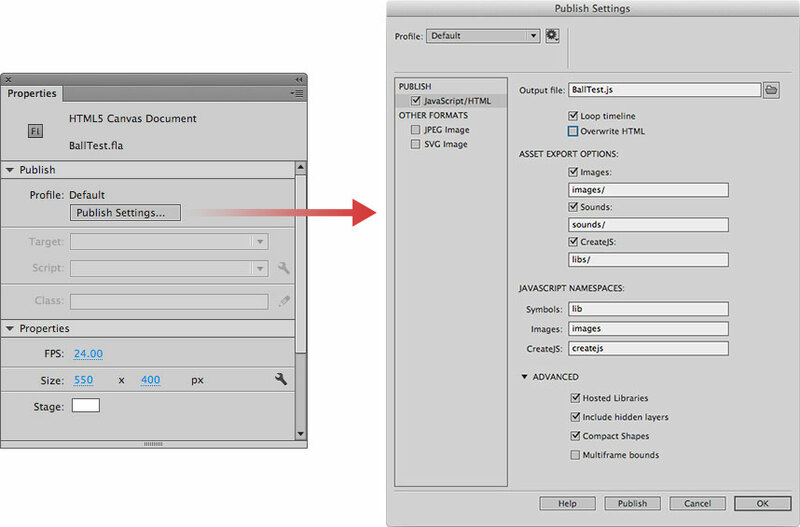 Press the publish button (if you closed the dialog, you can use File » Publish or F12). Alternatively you can publish your project by using the cmd+Enter keyboard shortcut (or ctrl+Enter for Windows users), which all Flash developers should be familiar with. Note: The directory your FLA is stored in is where your Canvas example will be exported to. You can change this location by clicking the browse button “ … “ in the publish settings. It is important to save your document, or this will be in a temporary directory that you might not be able to find easily. Now that we have successfully published our simple example, let’s have a look at what has been generated. You’ll notice 2 important files created relative to your FLA.
A simple HTML file that imports all required CreateJS libraries relevant to your exported project (unneeded libraries such as PreloadJS for images, or SoundJS for audio are omitted if you don’t use those features). A Stage instance, which points to the HTML5 Canvas element in the DOM. An instance of the root timeline is created and defined as the exportRoot. Finally, the Ticker class is used to set up an update loop, that will update your stage at the framerate defined in the FLA.
All the generated information from the FLA is included in a properties object, which defines your library settings (framerate, assets that need preloading, background color, etc). A class with the same name as your FLA (in this case “BallTest”) is available as well, which is a container object that holds all instances that have been placed on the root timeline of your FLA. This will become the exportRoot in the published HTML. That’s it! A bare-bones straight forward example on how to publishing HTML5 Canvas with Flash CC. In less than four steps you can create an HTML5 animation from a mature animation and illustration tool. Obviously this is not the most complex example, but should give you a decent idea of what is going on when publishing to Canvas. 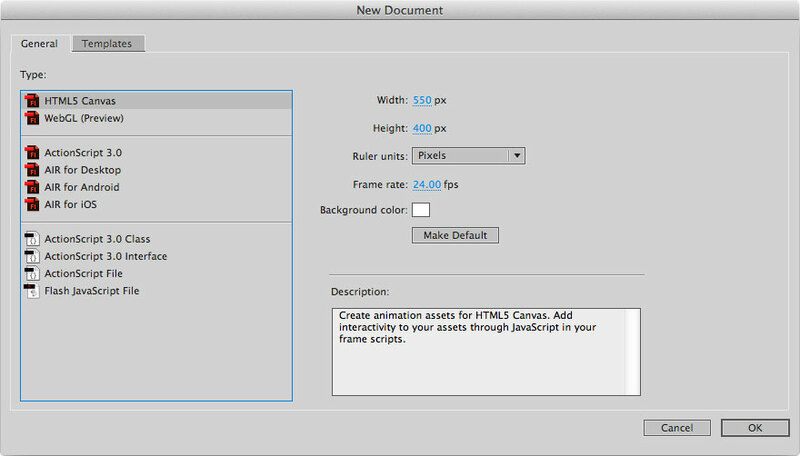 For more information on Creating and publishing an HTML5 Canvas document visit Flash Professional Help. For more information and documentation on the CreateJS libraries visit the CreateJS website. Stay tuned for part 2, where I show you how to work with the exported code. Easel JS Simplifies Working with Canvas in HTML5, EaselJS v0.2 Released for HTML5 Canvas, Music Visualizer in HTML5 / JS with Source Code, New versions of CreateJS released! How does this handle timeline as3 code or attached script files? Can I use this to help port some of my older flash games to html5? Here a simple example calling an alert box when a movieClip is clicked. I am planning to release a part 2 of this article that will take a deeper look at the exported process from Flash to Canvas. Stay tuned. If you have any other questions have a look at Stackoverflow http://stackoverflow.com/search?q=Createjs You’ll find tons of great people and answers to most questions. I can’t be the only person to want to re-parent class symbols with shared custom behavior, it was a pretty common AS3 practice, was it not? Can you cover the FlashPro Library items ‘Linkage’ property and its intended HTML5 canvas use case in an up-coming article. All it seems to do is rename the FlashPro Library symbol name in the exported.js, NOT the library symbols parent class. Wandering what the benefit of doing this on export is? Rather than just changing the symbol name in the library if one did not like the one they gave it in the first place. Really looking forward to these articles, thanks Sebastian . Regarding input text. While possible, it would be very limited, and tough to make very useful. A better approach is to use DOMElement, and maintain forms in the HTML DOM. This isn’t supported by Flash export, but will give you a lot more control over your content. How do I refer to frames or start/stop an animated MovieClip converted by Flash to a js script? Hello. Could you please be so kind to tell me, how to use downscale for shape animation in Flash CC? What is the name of the parent of objects placed on the stage in the timeline? What is their namespace? I ask since I have trouble referencing objects placed on the timeline when I’m using listener events. 2. movieclips objects and sub-objects states are not removed when no longer on the timeline, so in the next loop when it reaches their keyframe on the timeline it still remembers their states. thank you, Sebastian, for a very clear tutorial, I got the two files (html & js). But I cannot make them run, when I double-click the Ball.html file a blank screen shows in my browser. I’m a complete beginner in HTML/JS, though I’ve written a lot of games in Flash, which I’d like to convert. Can you please give a step-by-step set of instructions for the first time you make a canvas app run? something like: Do I have to set up some plugIn in the browser? how do I do it? do I have to download stuff? what? where do I put it? Could somebody tell me how to put video to my canva document? Hello, put video in html file, tag video or iframe YouTube, get him Id, and in js of flash canvas getElementById. Hi! Silly question, but how do I export this into a file I can send to someone? Ive created a canvas html and it has some basic interaction with buttons that go to another web page. How do I send this? How is the html and js usable? I don’t want to send friends a zip, is there an executable? And when this goes up onto a web page, what files do they need? Thanks in advance!! Where is “part 2” that you mentioned “releasing soon”? It’s now 9 months since this article, and I’m not seeing a part 2. Although I’m not sure why you’d mention it if it was never going to happen. Hi Matt, it’s in the queue. The article was written as a series, but work has a way of pushing stuff like this out. Thanks for your interest, we will try and prioritize it to get it out shortly! can’t wait for part 2 either! Would be great if you could incorporate a how to on offsetting the registration point of a movieclip on stage. Having trouble with this one, when animating using GSAP… Thanks! Can anyone tell me here that how can I change color of movieclip dynamically in HTML5 canvas.